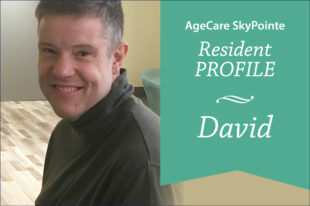 Both his towering 6’2” stature and his friendly disposition have enabled AgeCare SkyPointe resident David to continually keep the sunshine on his face. Growing up, David’s family and friends recognized that there was something unique about his disposition. However, it was not until he was almost 40 that he was given an official diagnosis of Asperger’s Syndrome, which is now classified as Autism Spectrum Disorder. Whatever shadows his diagnosis may have cast for him, however, David has found sunshine and purpose through his passion and talent for music. David recalls grade school as being a difficult time. Public schools in the 70s and 80s did not make accommodations for neuro-diverse students like David, and his family was constantly advocating against the school’s desire to place him in special needs classes. Although the curriculum caused an on-going struggle, it was in grade school that David discovered solace in his first true love, music. David fondly credits his grade 2 music teacher, Mrs. Ireland, for getting him “hooked” on piano. While David discovered his athletic abilities in junior and senior high, his passion for music remained strong. David learned to play Alto Saxophone in junior high and was an active member of the Central Memorial’s high school band. The pinnacle of David’s school days was when his band teacher, Mr. Eklund, arranged for the school band to perform a spring and fall concert at the Jubilee Auditorium in Calgary. It was at one of these concerts that David was given the opportunity to perform a piano solo. For those few special minutes, David delighted the Jubilee audience with his artistic aptitude. In his late teens, David also had the joy of playing saxophone with the Calgary Stampede Showband. From 1984 – 1988, David accompanied the showband for a number of different events, including playing at the opening ceremonies of the 1988 Calgary Olympics. David also traveled to Europe with the Calgary Stampede Showband in 1986 to compete at an international competition in Holland. David enjoyed this trip so much that he has been back twice to visit. Understanding the value of education, David eventually decided to go to university. Although he was originally interested in getting a music degree, he was counseled by a trusted advisor to consider pursuing a Bachelor of Arts instead. Due to the cost of tuition, David had to work part-time at Safeway’s warehouse in order to afford his university fees. David greatly enjoyed the English and outdoor music classes that were offered to him during his post-secondary academic pursuits. He specifically recalls the thrill of attending a lecture by author Timothy Finely as part of an English literature course, citing it as a highlight of university. In 2005, after 8 years of part-time studies, David graduated with his Bachelor in Arts from the University of Calgary. Throughout his adulthood, David has continued to pursue his passion for music. In 2005, he went to New York with the University of Calgary choir and performed Mozart’s Requiem Mass at Carnegie Hall. He now sings first tenor with The German Canadian Male Chorus of Calgary and had the opportunity to join the choir for a two-week tour in Austria in 2014. Recently, in December 2018, David volunteered with the Calgary Children’s choir and accommodated the Calgary Philharmonic Orchestra’s performance of the Nutcracker at the Jubilee Auditorium in Calgary. David believes that his involvement in the choir has saved his life as it has allowed him to connect with both himself and others; connections that are often difficult for those with autism to make. Knowing that he is continually supported in an environment where he can be himself, David is starting to plan for the future. He has his Class 1 driver’s license and is hoping to be given a clean bill of health so he can go back to work in the spring. Additionally, David has been learning a number of new piano pieces. He is playing Bach for the first time and working towards mastering the classic Huron Carol. David happily boasts that he can waste an entire day at his keyboard and he spreads this sunshine to the Whitehorn neighbourhood by sharing his musical gifts at the community piano. David says playing piano is like “dipping his hand in the candy jar,” it’s hard to stop once he starts. The Whitehorn neighbourhood offers compassionate, holistic, resident-centred care in a supportive environment for individuals living with complex mental illness and/or behavioural challenges. With a capacity of 64 funded beds, Whitehorn is located on the 4th floor of AgeCare SkyPointe community, situated in Skyview Ranche, NE Calgary. Our vision, at Whitehorn, is to provide a home-like environment that meets the needs and interests of residents, including mental health supports, recreational programming, and skills development. With a focus on recovery and rehabilitation, our team aims to support individuals in their personal development of a healthy lifestyle, where they can thrive with dignity, independence, and community participation beyond the effects of any mental health diagnosis. Learn more about AgeCare SkyPointe or the Admission Process.